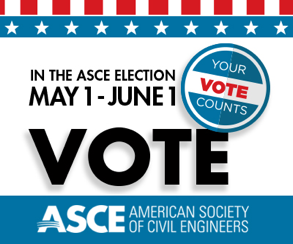 ASCE’s election will open Monday, May 1, 2017 at 12:01am Central Daylight Time. If you are a current dues paying member you should receive an email Monday, May 1st – check your spam folder. If you don’t receive and email, don’t worry because there are NO special codes this year. Go to http://www.asce.org/votenow and use your ASCE member login and password. Follow the instructions to vote and submit your ballot. The ballot this year includes a Constitutional Amendment to increase the size of the Board to allow the Third Technical Region Director to have a vote at the table. You can find more information on the nominees here. http://www.asce.org/elections/ The election will close at 5pm Central Daylight Time on June 1, 2017.